Are you a business person who needs quick access from your phone to your personal computer that is at your home? If yes then the Microsoft’s iOS and Android Remote Desktop apps are just the perfect options for you. Even if you are not a business or tech-savvy person, you might at times need access to your desktop PC that is at a remote location. What if you are on vacation and need to view a document from your office PC for an urgent client call? Or what if it is the other way round? You are in the office, and you need to view your shopping or grocery list that you have as an excel sheet in your home PC. If you own a Windows PC at the remote location and if you use an iOS or Android smartphone then the task of connecting and controlling your PC is easy and hassle-free. Thanks to Microsoft’s new app. Although many similar apps exist from other corporation, the fun of having an official app from the manufacturer of Windows PC itself is an added boon. Microsoft’s Remote Desktop apps for iOS and Android is an app that lets you control your PC remotely. It is now available for free at the Google Play Store (for Android) and Apple’s App Store (for iOS). This app will connect your smart device to the remote Windows PC using Remote Desktop Protocol (RDP). To use this app, you need to have your remote desktop option enabled in your Windows PC. This can be done by configuring the option in the control panel. 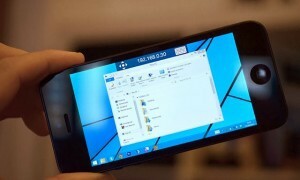 Although it will be tricky to operate a Windows desktop on such a small screen, the users will be blessed with ease since the Windows 8 interface is straightforward and smartphone friendly. Additionally, this app works on tablets and phablets too. Thus iOS users can use iPad, and the Android users can use any of their numerous phablets and tablets to have even better access to the remote desktop. The remote desktop is supported with an on-screen keyboard thus enabling users to have access to desktop PC specific keys like Ctrl, Alt, Shift, Enter, Tab, etc. This app will give its users an overall PC experience from their smartphone itself. However, there are two of the major drawbacks. Firstly, the App for both iOS and Android doesn’t have a better Touchpad simulator in comparison to the third party apps. Users feel the touchpad simulators of these are bit old-fashioned and complicated. The second drawback is that the app doesn’t auto detect PCs. The users must be well aware of the IPs of the remote PC that they want to control. Apart from these two hitches, there isn’t much to say on the negative aspects of the device. As the tagline of the App claims this app is indeed bringing “The Windows Desktop in Your Hands”. What’s very curious about the app release is that Microsoft has released apps for the remote desktop PCs to be accessed by its rival corporation smart devices but the Windows Phone app for the same is neither released, nor there are any talks about it. What’s your take on Microsoft’s Remote Desktop apps for Android and iOS? Previous ItemNokia Asha 500, 502, 503- What are the differences?